The principal scriptures of the Hindu dharma regard all, the gods or devas, demons or asuras and humans or Manava, as the same and all the three are considered to be born of supreme Lord Brahma. All the three worship the same Trimurthis, Brahma Vishnu, and Shiva, and possess the same inherent knowledge. The only secret to their contrasting nature is their approach to understanding and their attitude towards the realization knowledge, which the Brahma provided same to all. Asuras, considered as nature spirits are in constant battle with the Devas, sometimes called demigods and the latter in its literal sense translating to ‘heavenly, divine or anything of excellence’. It is where the Asuras derive their name from, the enemy of Gods, or the Demons. 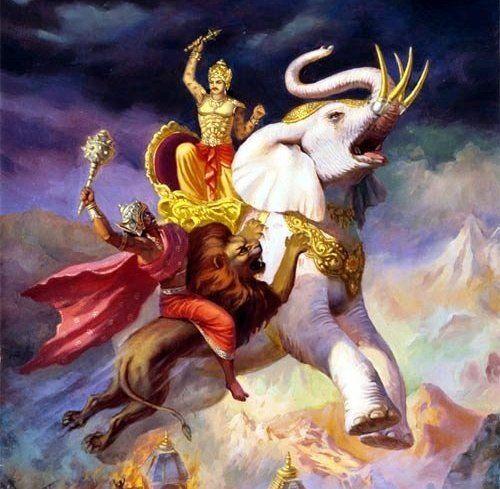 The scriptures boast of a total of twelve major wars between the two, some of them worth mentioning are; the Narasimha war, Subjugation of Mahavali by Bamana, the last to be mentioned here but the most bewildering one, the Samudra Manthan or churning of the ocean. Lord Nrisimha, an incarnation of Lord Vishnu in the form of part lion and part human, descended to protect His devotee Prahlada, who was terrorized by his atheist father, Hiranyakashipu and end the religious persecution that had been reigning the earth, evidently by the actions of the demon king who believed all should worship but hIm. After Sri Nrisimhadeva killed (and liberated) the atheist tyrant, Prahlada Maharaja was crowned emperor of the demons, the enemies of the demigods. The demigods then regained their sovereignty of heaven, which had been under Hiranyakishipu’s control. Another episode is of Vamana, of Sanskrit, which in its translation accounts to a Dwarf, is the fifth avatar of Lord Vishnu. He comes in the disguise in a time of crisis, when the Asuras have acquired disproportionate control over much of the Cosmic Universe. As the tales have it, the noble demon king Mahabali king sponsors a sacrifice and gift giving ceremony to consolidate his power, and Vishnu appears at this ceremony as a dwarf mendicant Brahmin called Vamana. When his turn comes to receive a gift, Mahabali offers him whatever riches and material wealth he would like, but Vamana refuses everything and states he would just like three paces of land. Mahabali finds the dwarf’s request amusingly small and irrevocably grants it. Vamana then grows into a giant of cosmic proportions. In one step he covers the earth, in another the heavens, and for the third, Mahabali offers his head on which Vamana steps, sending the demon king to the Patala, the netherworld. It is the Samudra Manthan or churning of the ocean, from where the Amrita, the drink of immortality was derived one of the most famously recognized episodes among the many legendary tales of the Hindu dharma, the enmity between the Devas and Asuras traces its roots. As the tales have it Indra, the King of heaven was rendered powerless and bereft of all strength, energy and fortune following the curse of Durvassa, a sage who initially had offered him a special garland given to him by Lord Shiva and was enraged as the garland was thrown to ground (although many tells depict it as the act of Airavata, the elephant Indra was riding on). In the battles that followed, the Asuras led by Bali, the asura king single-handedly defeated the devas and gained control of the universe. Devas sought help from the Supreme God Vishnu who advised that Devas form an alliance with asuras to jointly churn the ocean for the nectar of immortality and to share it with them. However, Lord Vishnu was cunning enough, he told the Devas that he would arrange for them alone to obtain the nectar. The churning of the Ocean of Milk was an elaborate process. Mount Mandara was used as the churning rod, and Vasuki, the king of serpents, who abides on Shiva’s neck, became the churning rope. The demons held to the head of the snake, while the gods, taking advice from Vishnu, agreed to hold its tail. Consequently, the demons were poisoned by fumes emitted by Vasuki. Despite that, the gods and demons pulled back and forth on the snake’s body alternately, causing the mountain to rotate, which in turn churned the ocean. When the mountain was placed on the ocean, it began to sink. It was then Lord Vishnu, in the form of a turtle Kurma, came to their rescue and supported the mountain on his back. In the due process of churning, a number of things were released from the Ocean of Milk. One of the many was the lethal poison known as Halahala, which as some tales have it, escaped from the mouth of the serpent king Vasuki and was so deadly that it could destroy all of the creation. This terrified the gods approached the revered Shiva, who then consumed the poison in an act to protect the universe. The Upadhi or title Neelakantha was attributed to Lord Shiva after this incident as his throat turned blue from swallowing the poison. Neelakantha, of Sanskrit Origin, is composed of two words Neela and Kantha, which in its literal translations is ‘the blue-throated one’. And finally, did Dhanvantari, the heavenly physician, emerge with a pot containing Amrita, the heavenly nectar of immortality. And no sooner, fierce fighting ensued between Devas and Asuras for the nectar. Protect the nectar from Asuras, the divine Garuda took the pot and flew away from the battle scene. Also, Lord Vishnu then took the form of Mohini and as a beautiful and enchanting damsel, Mohini distracted the asuras, took the amrita, and distributed it among the Devas, who drank it. Not that all Asuras were fooled, Rahu, disguised himself as a deva and got to drink some nectar. However, due to their luminous nature, the sun god Surya and the moon god Chandra were quick to notice the changing of sides. But before the nectar could pass his throat, Lord Vishnu in the disguise of Mohini cut off his head with her divine discus, the Sudarshana Chakra. But as the nectar had gone down his throat he did not die. From that day, his head was called Rahu and body was called Ketu. Later Rahu and Ketu became planets. Though story ends with the rejuvenated Devas defeating the asuras, it was after the episode of Samudra Manthan, which in itself is the epitome of conspiracy, a distrust for eternity was installed among the two and endless battles never to be over would soon start.